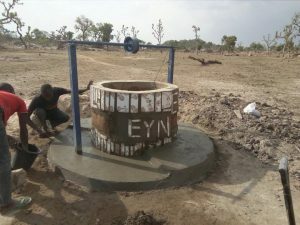 Chibok area received 2 new bore holes at Birgizu – The people in the area were so happy that the Village Chief and four people from the community traveled to EYN headquarters to convey their thanks. 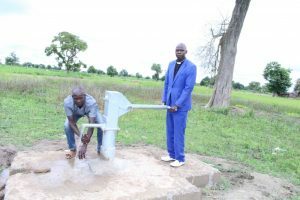 The delegation told the Disaster Ministry team that EYN has wiped their longtime tears for potable water and proved to them what it means to be Brethren. 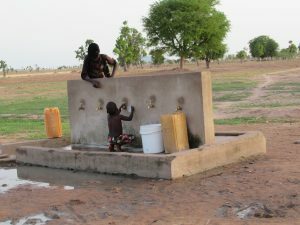 The area had struggled with different diseases because of the kind of water they had access to. Politicians left them with many promises, but it was the church that came through. They thanked the EYN Leadership, the Disaster Ministry and the donors (Church of the Brethren and Mission 21). To show their happiness they the presented the leadership with several liters of honey. Advanced Trauma Training was planned for a group from 4 districts still occupied by the Boko Haram. Security issues forced them to hold the training in Yola instead of locally. This proved to be a welcome respite for the participants as they were able to get away from the volatile conditions for several days. The participants of the Advance Training were selected based on their performances during the Basic Training on Healing and Rebuilding of our Communities (HEROC). 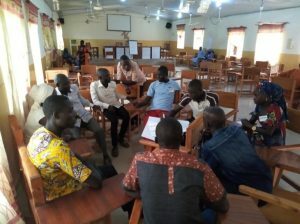 They will serve as the Listening Companions in their various communities and will work in collaboration with the EYN Peace Program to foster their work on Trauma healing in the selected areas and IDPs Camps. 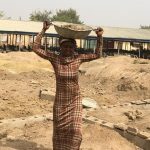 I am by a name Lydia; despite the Basic Workshop I had my heart was still heavy whenever I recall what happened to me during the insurgency of Boko Haram. But this training has completely healed my wound and I now forgive Boko Harams. My name is James; this workshop has personally changed and touched my life in diverse ways. First and foremost, I discovered that my life is precious and more important than anything, so I should not play with it but rather to take care of it. This training helped me to see myself as someone who can help others to see their problems in a realistic way and accept that even after a traumatic event life must continue but never attempt to destroy their lives because of devastation. 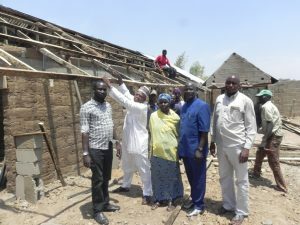 In addition, 15 children from the Garkida area were provided school fees; medical assistance and Hep B vaccinations were done at 3 locations; 5 homes were re-roofed in Lassa; and a food distribution was held at one of the relocation centers. First and foremost, I would want to thank God, and Church of the Brethren for giving me the opportunity to be at the Annual Conference and the one week of refreshing and learning about Brethren Disaster Ministry (BDM). After the Sunday Service at Annual Conference, we started our journey to North Carolina with Brother Roy Winter who was driving. We spent over night at Peterson close to Greensboro. The next day, Monday, we continued with our journey to the rebuilding site. We arrived there at 11.25am. 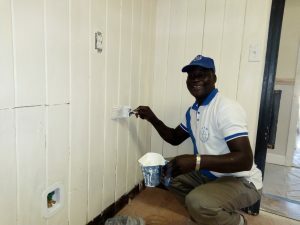 We met Harry and four volunteers working on the building, some were working on painting the interior walls, and others were cleaning the floor. Roy and I were given the permission to do the painting. Indeed, it was so nice that we worked for half an hour, laughing and enjoying the fellowship, we break for lunch at noon. Here I learned the commitment, willingness, sacrifice and humility of the volunteers. 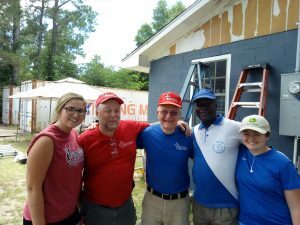 After the lunch, we drove to another site, where we met four active volunteers working on the outer wall of the house. Ann, a young volunteer was leading the team, and I shared a few minutes discussing the work and then we went to the Methodist Church where all the volunteers were sleeping. During dinner I was introduced by Roy and the other volunteers did self-introductions. Afterwards I told my story of how the Lord saved us in Maiduguri in 2009 and in Mubi 2014 when Boko Haram attacked. There was a moment of sympathy and concerns for Nigeria. I saw their love and sacrifice. After visiting the Ocean and an Aquarium, we continued with our journey to Maryland. I was first shown the Church of Brethren, where Roy worships. Then the next day, Thursday, 12th July 2018, we visited New Windsor. I was taken round by Roy to the School building which was formally Brethren Service Center property. I was shown where containers are received, from there we went around the warehouse and offices where I met with all volunteers and staff. It was amazing how things are well organized, volunteers are working with joy in their hearts, most especially, the man that is handling the machine for packaging of clothes. After that we had a meeting with Disaster Staff, (Jenn, was absent but she participated through Skype call). 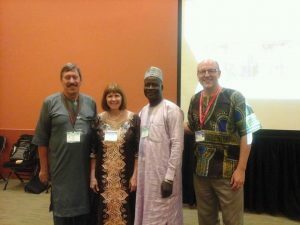 I was given the opportunity to share about our work in Nigeria and my story. After our meeting, we went to celebrate our work and my coming to the BSC at a restaurant (Hibachi) with a fantastic demonstration. 6. I saw a true heart of love, care, service and dedication in Brother Roy. May the Lord continue to bless the entire Church of the Brethren. The mean age in Nigeria is 18. That means there are as many people under 18 as there are over 18. That also means there are a lot of children in Nigeria. Everywhere you go, you are surrounded by kids. It was especially fun to take Carter Beecham with us on our last visit to Nigeria. Carter is 14 and he had fun interacting with all the children. Some places we visited the children could hardly speak English so communication was difficult. 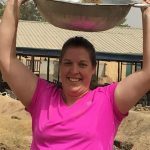 The Favored Sisters School in Jos has worked hard at teaching and using English and Carter had fun conversations with the children who live at the school. We brought beach balls, soccer balls, and jump ropes to give out to each school and camp that we visited. It was probably the first beach balls the kids had seen and they had a lot of fun keeping them in the air. Children in Nigeria do a lot of chores to help out around the home. Fetching water, watching younger siblings and helping with the farm are all jobs the children help with. School is not free in Nigeria and parents must come up with money for school fees. This is very difficult especially for the Internally Displaced Person’s who don’t have a way to earn a living. Some of the camps have makeshift schools but still many children have not received adequate education over the last 3 years. 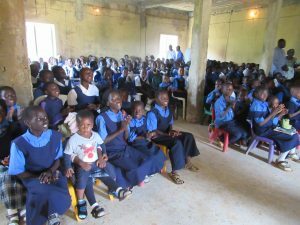 We continue to pray for all the children in Nigeria! 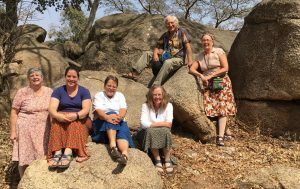 Early in June, Carl and Roxane Hill along with Kucheli Shankster Beecham and her son Carter had an opportunity to visit the ongoing work of the Nigeria Crisis Response. 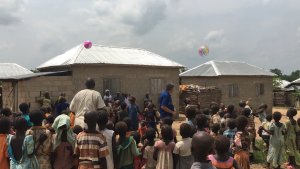 When we visited the “camp” or Relocation Village in Yola, we were greeted by a large group with songs of welcome and introductions. They proudly took us around their new village and showed us their homes. When this village was first built it was far from surrounding homes but the area is growing and now they have others around them. They have built a fence around the property to keep nomads and their cows from coming through the village. There is a solar powered water source and some surrounding lands for planting. Yes, the people have a safe place to live but they still miss their lives back home. 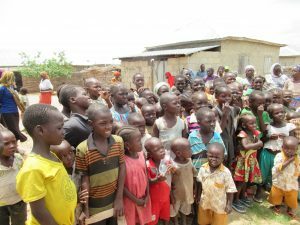 Most of these Internally Displaced Persons are from the Gwoza area where Boko Haram is still in control and they cannot return home. 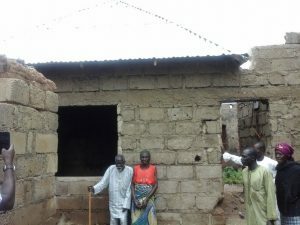 There are many challenges to living in a new village; neighbors are very close by, there is not enough land to plant all the food needed for the upcoming year, there is no school building for the children, the temporary church was blown down in the spring rains and so on. 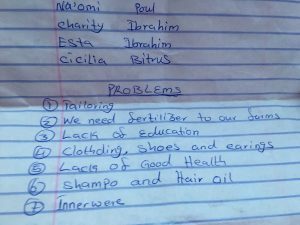 As we prepared to leave this new Relocation Village, the women handed us a list of concerns and items they needed. A woman from one of the Yola churches was traveling with us and she took the list; hoping her church would reach out to this new community. 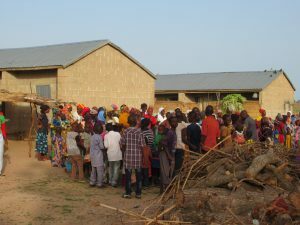 Let us continue to pray for Nigeria and all those living in Relocation Villages. 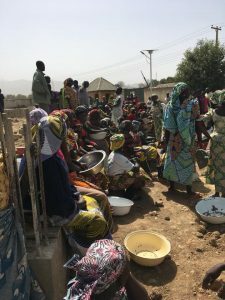 (2 Million people in Northeast Nigeria are still displaced and cannot return home.) 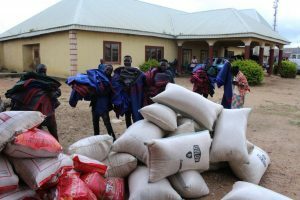 Pray also for the EYN Disaster Ministry as they try to meet the many needs that are a direct result of the Boko Haram insurgency. This interview was submitted by EYN’s Disaster Team Correspondent. Bear in mind that some of the blog may be difficult to read due to the horrific nature of the content. As we read news of the Dapchi girls being released and we near the 4th anniversary of the abduction of the Chibok girls (April 14th), we remember and pray for the hundreds of women, young men and girls who remain in captivity under Boko Haram. Here is what was shared by one of the rescued/released Chibok girls. On what about those that are married? “I don’t know. 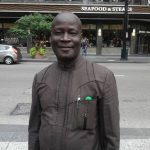 But for us, Shakau wanted to know our stand, ‘you are not doing sallah, I don’t understand which religion you are practicing?’ Then we said not that we are not doing sallah but we don’t believe the religion (Islam). He said ‘do you mean you still have your religion in mind since you are not following what is being taught? We did not bring you here for love or clothes. But those of you asked for marriage’. “Then he gathered those that are married and asked them, all of you who are married if you want to go back to your homes we can take you back. Then they replied that they prefer being killed in the forest and proceed to Aljan (Paradise). They are up to 60. Those of us killed by bomb are up to 10, and 9 died in the process of delivering, some are paralyzed, others lost their hands or legs, others can no longer hear properly, to communicate with them one has to shout before they are able to hear. The forest where we stayed has no house but they (BH) have tents where they cover themselves when it is raining. There were many guards around us”. “This is what we were writing among us”. 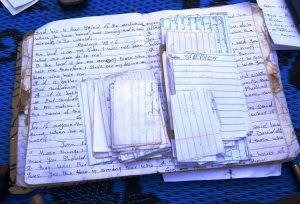 She showed us an exercise book where she said they used to write Words of God and letters to friends themselves in the forest. 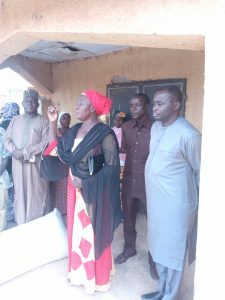 “One day Shekau’s deputy came to us – he dug a hole and lay down one of the girls in front of the hole, that she is going to be slaughtered. 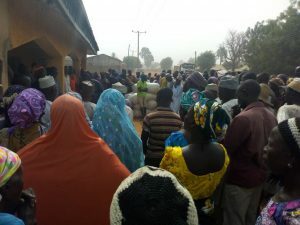 They called one girl, said to have been abducted when she visited her boyfriend in military barrack in Chibok. She was asked to slaughter the girl laying down. She said ‘is she a sheep or goat? ’one Boko Haram member replied her, yes she is a goat but not edible. She refused, that she cannot slaughter her. As she persisted, she was told to lie down so that she could be slaughtered instead, which she did. Then some of them (BH) said leave her while other members of BH said free them but would punish her when they would be freed. We were not allowed to look at them in the face. They beat us. When we were in the forest, a man appeared from the air to rescue us, but he fell in the midst of BH and was tied with rope dragged to forest and was killed. Another man, a father of one of us, went to free his daughter, that why his daughter should could be abducted. We made to understand that he is one of the sect members. Then BH told him if we are to free any not only one but all others. Gurku Interfaith community lies on the outskirts of Abuja, the capital of Nigeria. Muslims and Christians live and work side by side. 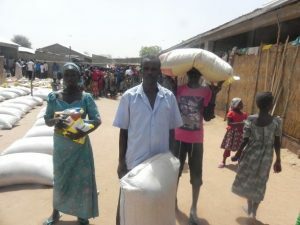 They are Internally Displaced Persons (IDP’s) who are from the Madagali and Gwoza areas of Northeast Nigeria, the area most affected by the Boko Haram Insurgency. 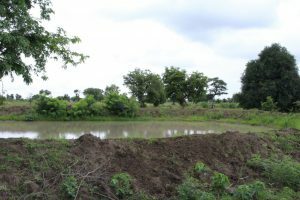 In December and January, news of various attacks reached the Gurku community. 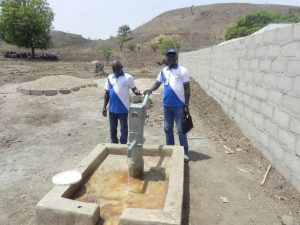 Since communication to this remote area is so difficult, the community decided to send volunteers to find out first hand what had been happening. Here is what they found: Nine villages had been attacked, 17 people killed, 39 homes burned, 28 businesses destroyed, and five villages had suffered looting of personal belongings and food supplies. With this devastating report, a committee was formed to plan a relief effort to the area. The committee included elders and youths from both faiths. 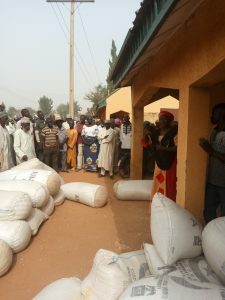 Nigeria Crisis Funds were able to provide $7,500 for the project. How do you get help to areas where it is almost impossible to travel? How do you let the remote areas know that help is coming? Who will be willing to travel to the area to take the relief? How do we get help to the most vulnerable? The committee dealt with all these logistical questions. Three zones were designated to get the relief. The recipients of the relief were chosen from among the neediest. It was determined that 74 families who had lost loves ones would be given cash support. 116 bags of corn would be divided among 580 families. The corn was purchased from nearby markets. Two vehicles and local hunters were engaged to transport the corn. Help was secured from military and security personnel. After all the preparation, it was time to actually enter this highly unstable area and get the food and money to the people. 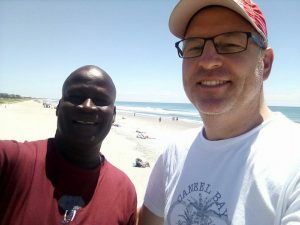 Markus Gamache, one of the founders of the Gurku Interfaith community, was invited to participate and take the relief to the three zones of Shuwa, Gulak, and Madagali. This project was only obtainable by the huge effort of the committee from Gurku, Markus Gamache, and countless other volunteers along the way. To receive the aid, people had to travel quite a distance to reach one of the three distribution points. 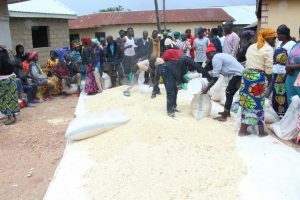 Plans were also made in each zone to cover transportation of some of the corn to remote areas that were not accessible. In all, 658 families were assisted. The families who received cash got about $30 each and they were very grateful. They said the cash would sustain them for months by helping purchase food, provide travel to fleeing families or pay for medical services. The families who received corn were also extremely thankful. 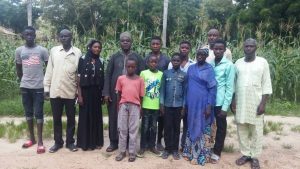 Some of these families had not eaten for three or four days due to recent attacks. 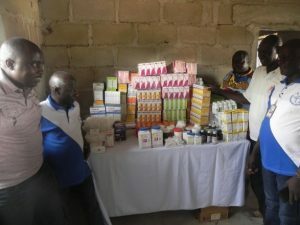 Thank you to everyone for their continued support of Nigeria Crisis Response! Without your help, this special distribution would not have been possible. The Nigerians we worked, played, traveled and worshiped with are for the most part as hospitable, optimistic, fun-filled and humorous as I remembered. Their faith in the goodness and protection of God is strong and deep. I believe I saw more sadness in more eyes than I saw nine years ago, which is to be expected from the brutality and losses they have suffered, but their resilience and determination to live happily and trust in God is amazing, to say the least, to this American. 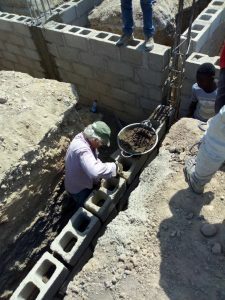 The actual work we American Brethren did in building foundations for that huge church in Michika was negligible, considering the scope of the project and the fact that almost all the work is done by simple muscle and sweat. But there is no doubt our presence was extremely encouraging, inspiring and soul-filling to the people there, for they told us of their appreciation countless times and in many ways. Many people told us that our just being there eased their fear. Folks often commented on the great sacrifice we had made, leaving our comfortable, safe homes and traveling to a place so rough and dangerous. I didn’t feel that way at all, of course, and felt the deepest gratitude and joy to be so well taken care of, so loved, not to mention just getting to be in Africa! The Nigerian Brethren’s relation/stance toward Muslims is complicated. The church is remarkably faithful to Jesus’ teaching of loving and forgiving our enemies. I can’t even imagine Americans being so faithful and obedient. 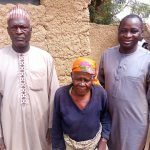 At the same time, there is a whole lot of bitterness and resentment toward Muslims in Nigerian Brethren I was with. In many places in Nigeria Christians are second-class citizens. Nigeria is the only country with roughly equivalent numbers of Muslims and Christians. They have to get along. Add to that five hundred different languages and hundreds of different tribes, as well as castes…. It is a rough place to have a nation. Is it any wonder the church is so vital to our brothers and sisters of the EYN? Pray for them. Pray hard. I had the opportunity to go to Chibok for a short visit, where I never dreamed I would be able to go. Markus Gamache had some business up there one Saturday and took Sharon Franzen and I along. I had visited in 2009 and had vivid memories. The military were not happy that we foreigners were there. 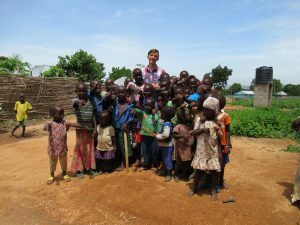 We went to the Bible School to investigate the location for a bore hole they are planning to dig, and we visited a church and a family nearby. Some huge trees which had provided shade and a gathering place at the Bible School had been cut down by the army as some kind of military precaution. I know there are much deeper harms that have been done at Chibok, but it was painful to see those dead trunks in the hot sun. War is the work of the Devil, no doubt about it. Another day after work we visited Lassa, where again I had thought I would not be able to go. It was kind of a spur of the moment trip, and we traveled a rough dirt road through forest and bush from Michika to Lassa. I had spent a couple of days there in 2009 and two boys had adopted me and hung with me the whole time–Siliarnad and Paul. 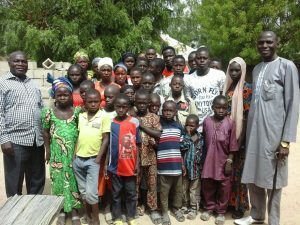 I had no way of knowing what had happened to them when Boko Haram overran Lassa, but I knew teenage boys would have been prime targets for killing or kidnapping. 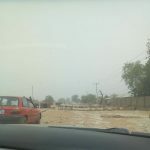 We arrived at Lassa EYN #1 church (which was rebuilt by Muslim-dominated Borno State–there’s a story there which I do not know) and there were few people in the church compound, but there was a boy sitting alone in a large courtyard playing a drum. In conversation with the boy I soon discovered that he is a younger brother of Siliarnad. Siliarnad was off in Yola taking a college entrance exam and Paul was alive and well in the town. Some days God just takes a direct hand.